Please have a look at Klim’s sizing chart below to choose a size. We measured a sampling of sizes in this jacket and found the chest, waist and hip sizes to match the chart pretty well. The hips have a couple vertical zippers you can open to get more room over the hips which is a nice feature. 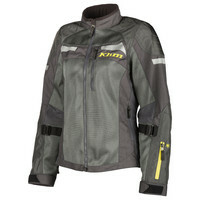 The Klim Avalon jacket for women is just the thing for hot summer riding. The design allows tons of air flow through the shell and the materials are extremely strong to give excellent impact and abrasion protection in case of a fall. The mesh material used in this jacket is Klim’s “Karbonite” material which is extremely tough feeling. Klim says the abrasion resistant properties are 7.5 times better than many other brand’s mesh materials. In feeling the material, I’d bet they are right. One of the down sides of a full mesh jacket has often been the lesser strength of mesh materials as compared to non-summer materials like leather or textile, but with this jacket you don’t have to compromise. And for impact protection this jacket is fitted with a full set of D3O armor… elbows, shoulders and back. The D3O in this jacket is a Klim exclusive. It is molded with more holes than the standard D3O and will vent better, which is welcome in a jacket made primarily for summer use (see our picture gallery). D3O is VERY comfortable to wear and is CE rated for impact protection. There is nothing else to buy. Klim says: Engineered to keep women comfortable in the warmest riding environments while providing class-leading protection with proprietary KLIM® KARBONITE MESH™ Technology which yields a final highly-flexible mesh material that is up to 750% stronger than polyesters used by other brands.